Superior Veterinary Surgical Solutions - Board-certified Surgeon in Central Florida USA :: Georgia - I can pee again! 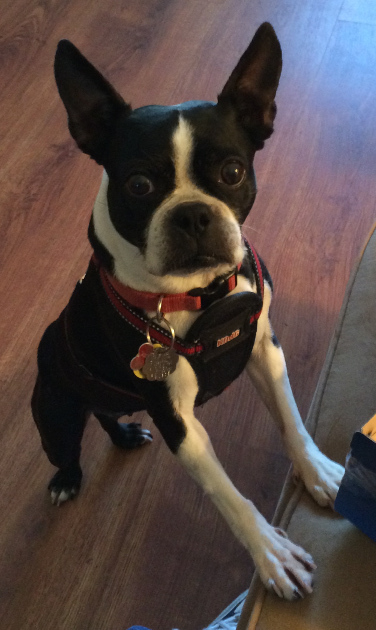 The short version: Georgia is a sweet little Boston Terrier who developed a tumor in her urethra (the tube through which urine exits the bladder to leave the body). The tumor obstructed the urethra, so that she could not urinate. I saw Georgia on a Wednesday, measured her urethral size, emptied her bladder, and placed a urethral stent the following day. Immediately she could urinate again, and went home a happy, healthy dog again the next day. The longer version: Georgia is a sweet little Boston Terrier who developed a tumor (transitional cell carcinoma, or TCC) in her urethra (the tube through which urine exits the bladder to leave the body) at the age of eight years old. The tumor was treated by the expert cancer specialists at Southeast Veterinary Oncology (They are wonderful on all levels), but the tumor -- TCC is unfortunately very resistant to medical and radiation therapy -- eventually (15 months later) obstructed the urethra, so that she could not urinate. I saw Georgia two days later on a Wednesday, when the owners could travel down from Georgia. I measured her urethral size, emptied her bladder, and placed a urethral stent the following day. The stent, designed by Infiniti Medical, was placed over one of Infiniti's specially designed hydrophilic guide wires (they adhere to water/saline, making them very slippery and easy to pass through even an otherwise obstructed urethra) with digital radiographic (x-ray) and fluoroscopic guidance. Immediately, Georgia was no longer obstructed, and she could urinate again. She went home a happy, healthy dog again the day after that. No surgery. No pain. No recovery. No E-Collar. For more information (including images of a urethral tumor pre- and post-stenting), see here. Please schedule an appointment with our board-certified surgeon, Dr. Jeff Christiansen, at the clinic of your choice to evaluate your pet and discuss urethral stenting to improve your pet's or patient's length and quality of life.